Dan Harmon himself will be present for the Austin Film Society and Alamo Drafthouse presentation of Harmontown, followed by a live taping of his popular podcast. For those who purchase the VIP tickets, you'll also get exclusive access to a party. For more information on ticket prices and AFS member discounts, visit the AFS website. More about Harmontown: A kindred spirit to nerds everywhere, writer-comedian Dan Harmon has achieved celebrity via the hit series Community. 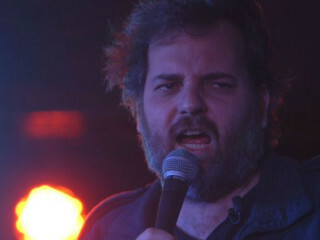 After being fired from his signature creation, Harmon hit the road with his popular podcast and performed live for his cult-like fan base across the country. From director Neil Berkeley and featuring past and present collaborators Sarah Silverman, Jack Black, Allison Brie, Joel McHale and more, Harmontown tells Harmon's story — his highs, his lows and everything in between. Austin Film Society, Alamo Drafthouse, and Guzu Gallery.